The U.S. Environmental Protection Agency protects public health and the environment in a variety of ways, but one of the most important ways is through the development of regulations. EPA regulations cover a range on environmental and public health protection issues, from setting standards for clean water and establishing requirements for proper handling and reductions of toxic wastes to controlling air pollution from industry and other sources. Each year, the Agency develops a considerable number of rules which address highly technical, scientific, and complex environmental problems. This website’s design is easy to navigate and simple. In the top right corner, there are options to change the language as well as the standard search bar. 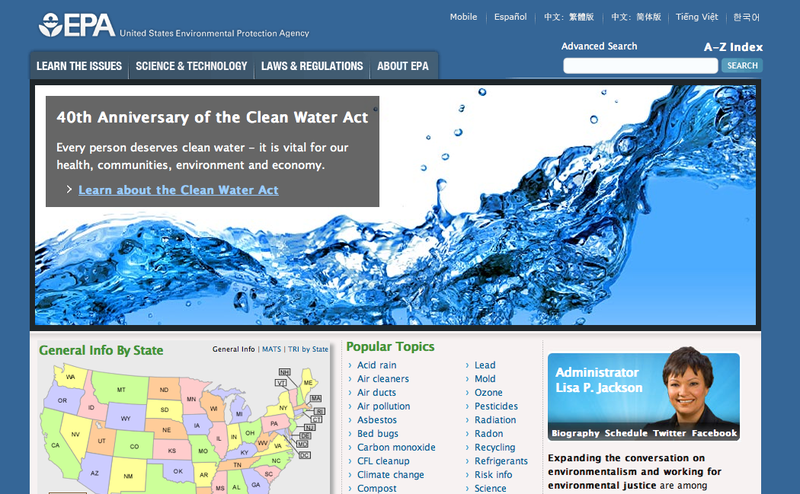 The website follows a three column template: visitors can find general environmental information by clicking on a specific state of the US map, the center column has “Popular Topics” links, and the right column links to the EPA’s social media accounts and blogs. This site does not rely heavily on images. Audience: Older demographic who are interested in conservation, government policies, science, technology. The first link on the front page is “October is Children’s Health Month,” so perhaps parents.